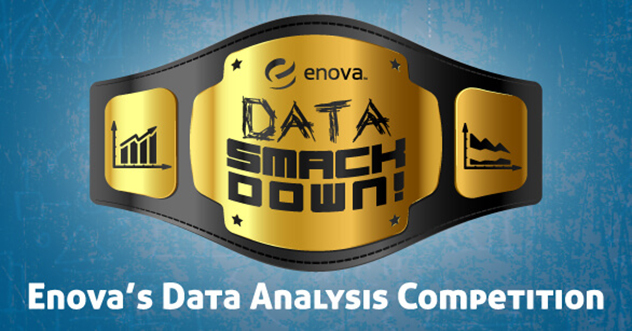 Data Smackdown is Back - Enova International, Inc.
Enova will be inviting students from local universities to our office on February 7th to challenge students with the 5th annual data analytics competition — a.k.a. Data Smackdown. The event allows teams of future analysts to compete to see who can come up with the best method and results. The event will start at 5:30 p.m. and is expected to last until 11:00 p.m. Teams of 1 to 4 people will compete against each other, analyzing a data set in a business case. Be sure to bring a laptop, power cords and your student ID. And don’t worry about food; dinner is on Enova! After check-in, the rules of the Smackdown will be defined, and each team of one to four people will be presented with a data set in a business case. You and your team (1-4 team members) will work to analyze the data and make recommendations. Work must be finished within the room to remain in the competition. At the end of the evening, 1st, 2nd and 3rd place will be awarded. Students can register in full teams or register individually and request to be paired with other students looking to be on a team.